Softomotive offers sharp business solutions, premium support and professional services that organisations need to get the most out of their enterprise automation. 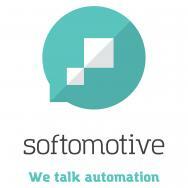 Trusted by more than 6,000 companies worldwide, Softomotive is one of the leading Robotic Process Automation providers. The company has been operating for more than 10 years in the software automation market, and offers the most reliable and scalable automation solutions, bridging the gap between best-of-breed technology and continuous innovation to deliver true business transformation.